The European Central Bank (ECB) president has given an ebullient speech on the enduring strength of the eurozone and the 'tangible improvements' he has witnessed in the state of the UK economy. Speaking in London this week, Draghi declared that three of the weakest eurozone economies - Ireland, Spain and Portugal - had all made 'impressive' improvements in economic performance, mainly down to increased exports. And that the turnaround has been achieved despite the 'anaemic' lending from banking. (It's not often that you hear bankers bash bankers, is it?). He added that the euro as a currency has remained steady. 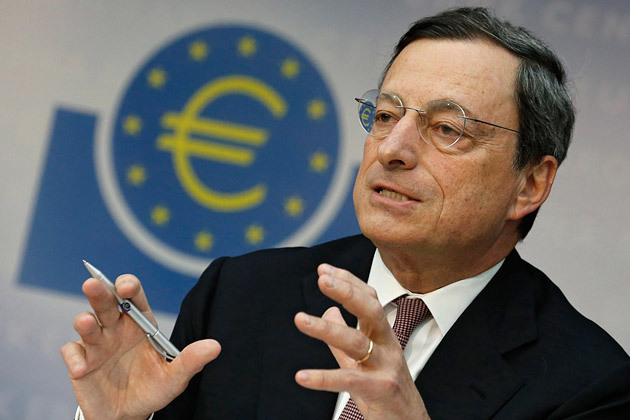 '[The markets] are fully confident that the euro is a strong and stable currency,' declared Draghi. Or is it just that the weaker-than-expected Chinese data and the US Federal Reserve's decision to slow down its money stimulus have proved a distraction from the eurozone's woes? Indeed, Draghi's words do rather belie his actions. The ECB has cut eurozone interest rates to a record low this month to help companies manage their debts. The latest PMIs for the region also make for pretty grim reading: the eurozone has remained in recession in the second quarter. Even Germany, Europe's powerhouse economy, has barely posted any growth for the first three months of 2013. His speech also contained a thinly-veiled message to PM David Cameron. 'The answer to the crisis has not been less Europe but more Europe,' said Draghi, alluding to the current political debate about the UK remaining a member of the EU. 'What I can say is that Europe needs a more European UK as much as the UK needs a more British Europe,' he added. Cameron has been telling anyone who'll listen that he plans to renegotiate the UK's role within the EU and hold a referendum on membership before the end of 2017, should his Conservative Party win the next general election. Draghi is strongly hinting that this would be a bad move for everyone. But will Cameron do a u-turn on this particular crowd-pleaser? Unlikely.